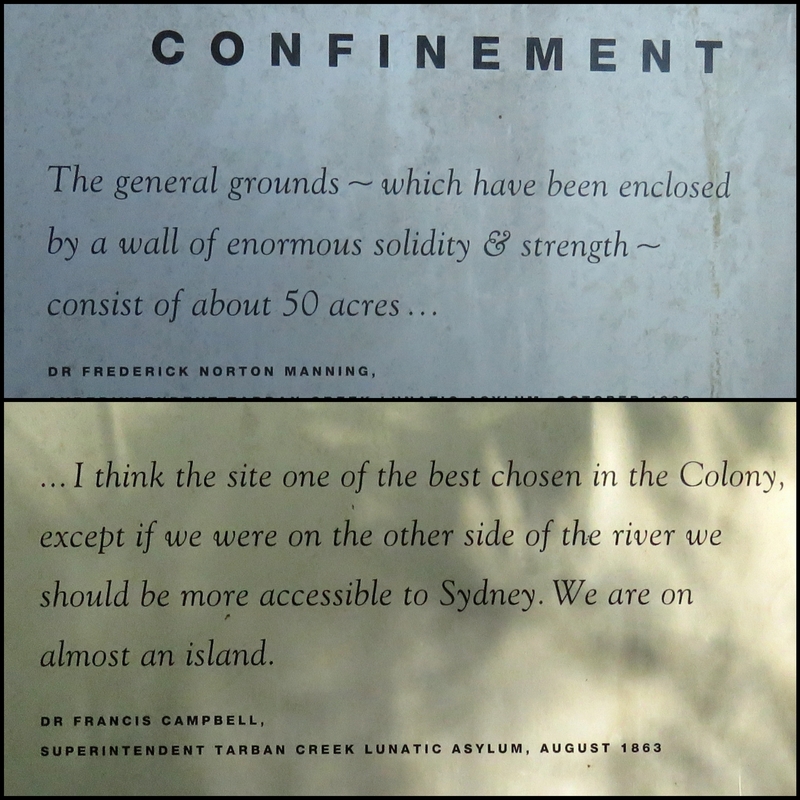 While the sublime natural setting of the early Lunatic Asylum was selected for its curative influence on the minds of inmates, its isolated location on the Parramatta River also ensured they were totally removed from society. For many patients, the asylum was not a tranquil retreat, but place of incarceration. 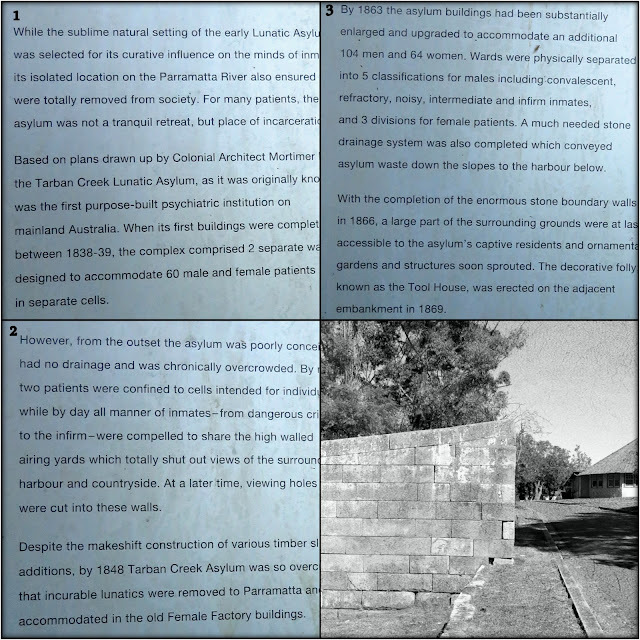 Based on plans drawn up by Colonial Architect Mortimer Lewis the Tarban Creek Lunatic Asylum, as it was originally known was the first purpose-built psychiatric institution on mainland Australia. When its first buildings were completed between 1838-39, the complex comprised 2 separate wards designed to accommodate 60 male and female patients in separate cells. accommodated in the old Female Factory buildings. By 1663 the asylum buildings had been substantially enlarged and upgraded to accommodate an additional 104 men and 64 women. Wards were physically separated into 5 classifications for males including convalescent, refractory, noisy, intermediate and infirm inmates,and 3 divisions for female patients. A much needed stone drainage system was also completed which conveyed asylum waste down the slopes to the harbour below. 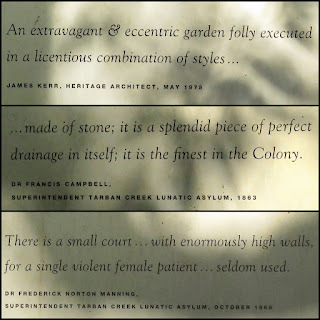 With the completion of the enormous stone boundary walls in 1866, a large part of the surrounding grounds were at last accessible to the asylum’s captive residents and ornamental gardens and structures soon sprouted. The decorative folly known as the Tool House, was erected on the adjacent embankment in 1869. The folly (Bush House) is part of a 19th century garden which was built in the grounds of Gladesville Hospital. It won't be long before this all falls down and is gone for good. The place is being swallowed by vegetation. This was once a garden. Ornate fixtures on the folly. Granny's Cloak Moth (Speiredonia spectans) in the 'shed'. Former Medical Superintendent's Residence, Gladesville Hospital. Shed in need of repair. Old Workshop. For King and Empire - Erected by Officers and Staff of Gladesville Hospital. Tunnel under Victoria Road, south side. View from in the tower. Steps leading up from Bedlam Bay. Steps leading up from Bedlam Bay to Campbell Drive entrance way. Bedlam Bay and Parramatta River. drainage in itself: it is the finest in the Colony. Field of Mars Cemetery, Ryde.